Tests on aluminium cladding panels, of the type used on the Grenfell Tower, have shown that the presence of water may cause violent chemical reactions and accelerate flames. 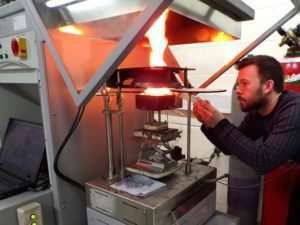 University of Portsmouth civil engineering student Laurence Casey carried out experiments in a specialist fire laboratory to find out why the panels could be a fire risk, despite having initially passed safety tests. His investigation looked at the role water, in the form of steam, might have played in the spread of flames at the North Kensington tower block after the fire broke out on 14 June last year. Mr Casey's research stemmed from initial experiments conducted by Professor Laurence Harwood, of the University of Reading, for the BBC's Inside Out programme. Professor Harwood found that a violent reaction occurred when he directed a fine spray of water onto aluminium cladding sheets that had been heated to 300 C.
Mr Casey developed Professor Harwood's experiments with his own research to gather quantifiable data. 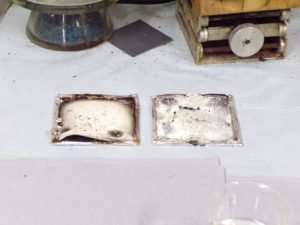 Mr Casey said: "Prior to the laboratory tests, I had doubts about the reaction between the aluminium and steam occurring. Although aluminium is a highly reactive metal, the chemical reaction does not always develop when steam meets aluminium because of the protective oxide layers present on the surface. Once I had completed the tests, my doubts were lifted and I was confident the reaction took place. The results were shocking and to put things into perspective, the panels exposed to additional water produced more heat energy than burning petrol." Using a cone calorimeter, which measures heat release, Mr Casey found that when water was applied to hot aluminium composite panels, a vast increase in the rate of heat release and heat of combustion occurred. This is thought to be a result of a chemical reaction producing hydrogen, a highly flammable gas, which subsequently burned, generating more heat and contributing to the acceleration of fire. The increase of heat energy released could pose a further risk to the ignition of flammable materials nearby, and could increase the rate at which the fire spreads across the façade. Professor Harwood has considered if weathering of the cladding could allow more water absorption in the insulating foam over time. The theory would be a possible explanation for the cladding passing initial tests but failing later ones. He also says that water from the fire brigade would not be a factor as the volume would quench the flames. Laurence Casey says that without speculation, the source of the water vapour and the process of how it reaches the aluminium surface is unknown. Therefore, future research will investigate the effect of inherent water in polyethylene layer cladding systems, absorbed rain water and water from the initial quenching of flames. 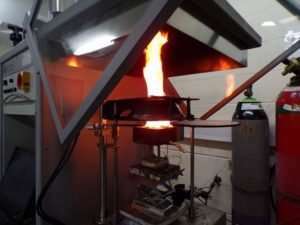 The cladding used on the Grenfell Tower failed tests undertaken by BRE (British Research Establishment) during a fire safety programme launched after the tragedy. It has been concluded that this is primarily due to the use of a polyethylene inner core. Mr Casey said: "This research raises the question whether some tests used to achieve compliance with certain building regulations are fit for purpose, and if they present the true fire performance of materials used in façade systems. There are several factors that need to be taken into account regarding the fire performance of a façade system; such as the type of insulation used, the presence of a cavity causing a chimney effect and we now know in the case of aluminium panels, the presence of water. These need to be tested in combination before any system is approved by regulatory authorities." Graduate Mr Casey carried out the tests for his dissertation under the supervision of Dr. Laurie Clough, a teaching fellow in the School of Civil Engineering and Surveying at the University of Portsmouth. Professor Harwood was also involved providing advice as an external expert. Professor Harwood has written to the Grenfell Tower Inquiry with his initial findings. He said: "This may explain why cladding removed from a number of buildings may have failed fire retardancy testing following the Grenfell Tower fire, despite the individual components having been found to be compliant with requisite fire regulations by the manufacturers." This was a preliminary study and Mr Casey is hoping to continue investigating his results with more thorough studies. He said: "We need more concrete evidence and consistent testing methods to really understand the behaviour of aluminium during a building fire. But for a preliminary investigation, this is quite a significant result. There is clearly a knowledge gap in this area and Grenfell Tower is an example of the potential consequences of getting these things wrong."